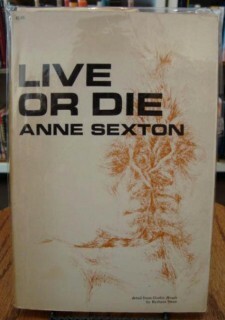 What fascinates me about Anne Sexton is how normal her life appeared as a young housewife and mother in the 1950s. Except she was not ordinary by any means. She was institutionalized for mental illness for a spell -- shock therapy and all that. Whatever happened in there, it unleashed such a deep dark vein of personal memory and trauma it burst into her work and quickly won her a Pulitzer Prize -- just ten years after she learned how to write poetry. Her timing was impeccable. Confessional Poetry was going mainstream, her blank verse bespoke with a voice of a strong confident liberated woman who knew what she was talking about, and she learned with the best; her New England circle of poets included Sylvia Plath and Robert Lowell, two major American poets in their own right.